When you hear the term conversion rate optimization, what comes to mind? If you’re like most marketers, you probably think sales. And of course, from a business perspective, that’s the bottom line. We all want sales. But if you think about it, there are a lot of small milestones that precede the final sales. And some businesses—such as nonprofits—aren’t trying to make a sale. Does that mean they can’t optimize conversions? Conversion goals differ depending on the type of business you run. And even if sales are your final goal, you may have smaller conversion goals that can tell you whether your prospects are moving smoothly through your funnel and where they may be falling out. Once you understand which conversion goals are important for your own business, you’ll have an easier time optimizing for conversions. So with that in mind, let’s review the different types of conversion goals you might set up. To be clear, your conversion goal is the outcome you expect for the Web page you’re optimizing. It should be measurable. Otherwise, you have no way of knowing whether you’re reaching your goal. It should also move visitors toward the over-all business goals you have for your website. 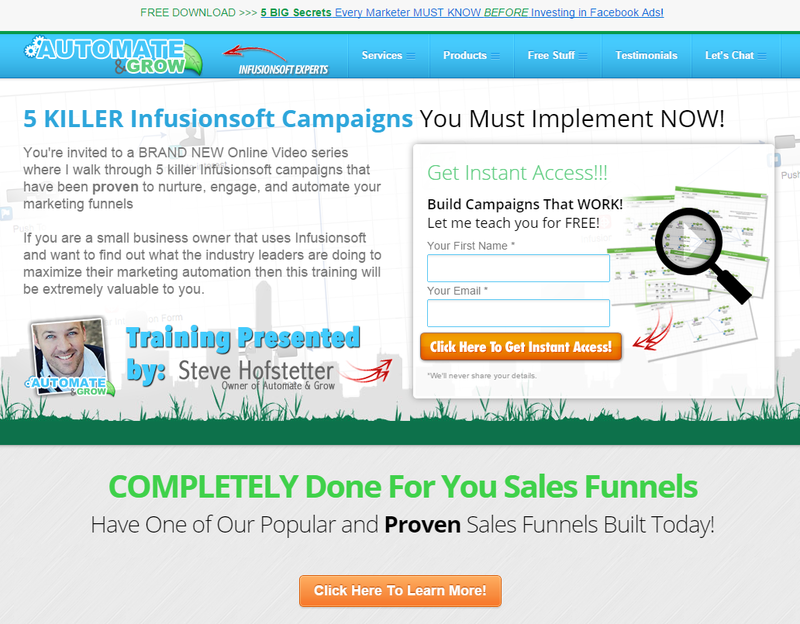 For instance, on AutomateAndGrow.com, the over-all business goal is for visitors to become consulting clients. But its owner, Steve, understands that asking people to sign up immediately, no-questions-asked, for expensive consulting would be like proposing marriage on the first date. So he’s created smaller goals that bring in new prospects and nurture them prior to the final offer. What has Steve done here? He’s set up “micro goals”—first opt-in, then watch his training videos, then sign up for free consultation. Each micro goal leads to the next, building relationship and trust. When he finally pitches his regular monthly consultation, you’re ready for it—and you know exactly what he can do for you. As a result, he likely has a good conversion rate for this offer. Unlike AutomateAndGrow, the American Heart Association doesn’t sell anything. According to this burb on their home page, their macro goal is to help people achieve healthier lives. From a quick review of their website, it looks like their primary goal is to get people to read and act on their content. They may also want people to donate, volunteer, or use their health-related tools and programs. As a result, the home page is set up as an information site. 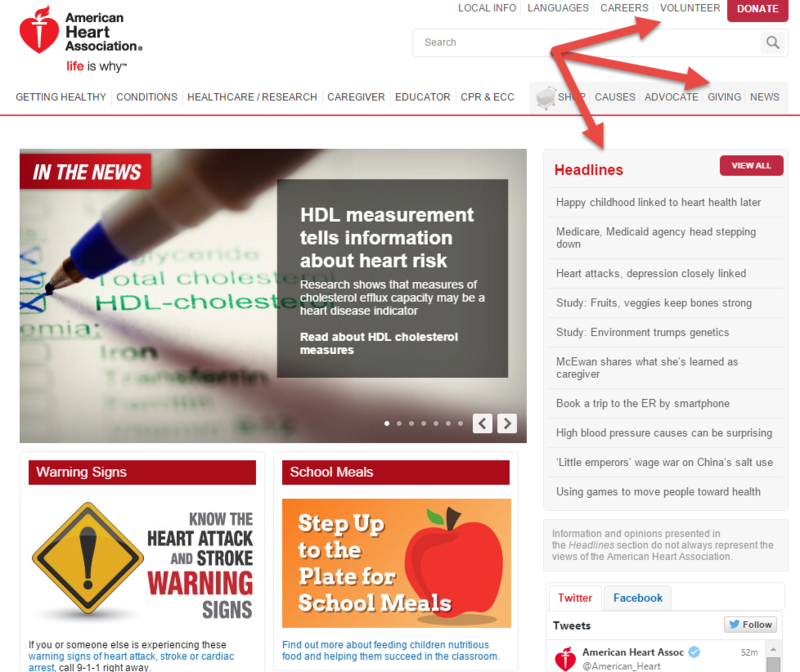 I assume the most important pages relate to new information on cholesterol, heart attacks, and school meals, since these are in the “feature” spots on the website. Donations are probably the second priority. Notice in the upper right corner, the red tab labeled “Donate.” This is a nice treatment, drawing attention to the tab, but they would probably do well to repeat that offer on the page. People don’t always see the links at the very top of the page. 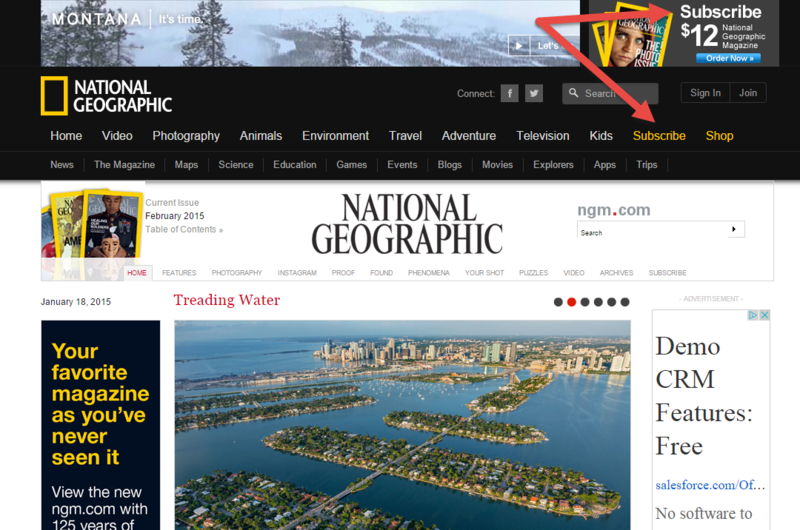 National Geographic, as you might guess, is interested in subscriptions. Nothing on their home page distracts visitors from this goal. Notice that the first thing they present you with is the opportunity to subscribe. And in the navigation panel, “Subscribe” stands out in gold. A secondary goal is to get you to consumer their content. So the rest of the page has links to their articles. Well done, NatGeo. Your macro (or final) goal is the end action you want visitors to take when they visit your site. It may be a product purchase or subscription, a donation, or signing up for X number of consulting hours a month. Your end goal really depends on your business model and what you need your customers to do. The macro conversion you’ve set for your website drives every other strategic element on the site: the copy, design, layout, everything. But for any macro conversion to take place, visitors often go through a series of micro conversions. These are the small steps they must take to understand the value of your offer and gain enough trust to take action. Usually, micro conversions take place as a series of actions, like the AutomateAndGrow example above. But on occasion, they can take place at once. Users can take these actions in any sequence they like, and even skip ahead if they wish. Every micro conversion should help visitors make the macro conversion. If there’s anything on the page that’s distracting or confusing, it needs to be removed or reworked. That’s non-negotiable. Because from a CRO perspective, improved conversion rates are the measure of success. So what conversion goals are right for your business? Let’s take a look at some different business models and the conversion goals you may need for each. Here, I list both macro and micro conversions. Your job is to decide what path visitors usually travel to reach conversion, and then optimize that path. To improve conversion rates, you not only need to have goals set up, you need to be able to measure them. So, for instance, if you include a link for visitors to download a PDF but have no way to measure how many people click the link, you have no idea how many people are converting. In this case, your conversion goal is a download, but to improve your conversion rate, you need to know how many people are visiting the page and how many of those visitors are clicking the link. The measurements that help you increase your conversion rate are called Key Performance Indicators (KPIs). The KPIs that matter most are the ones that apply to your conversion goal. What are your conversion goals? Your task is to identify the micro conversions that will lead to your macro conversion and to find a way to measure the completion of each. Evaluate the macro conversion(s) for your website. Can first-time visitors easily figure out what it is? List the micro conversions that lead up to this final conversion. Then review your website to see how well you’re presenting these offers. Look for strengths and weaknesses, and where you need to focus your optimization efforts. List your macro conversion(s) for your site. What is the final action you want visitors to make? List the micro conversions visitors will likely make before being comfortable taking this final action. Brainstorm for ways to drive those micro conversions. Then build those pages and begin measuring, testing and optimizing. If you run a business website, your job is to optimize for conversions. That’s why it’s so important to understand what goals you should set for your type of business. Your primary conversion goal may (or may not) be sales. But whatever it is, in order to achieve that final conversion, you may need to set smaller conversion goals to build and nurture relationship first. Over time, with incremental improvements to your micro conversions, you’ll see your bottom line—whatever that may be—improving as well. Need help measuring visitor behavior on your web pages? Crazy Egg heatmaps are a great way to see what people are doing on your website (even if you aren’t comfortable with Google Analtyics). Get your free trial today. What’s working for you? Are you comfortable setting conversion goals for your web pages? Let us know in the comments below. Read other Crazy Egg articles by Kathryn Aragon. The post Conversion Goal? It Depends on Your Business Model appeared first on The Daily Egg.